A great deal of focus has been given to the staggering amount of equity (tier-1) capital European banks will need to raise in the near future. Between Basle III and negative performance (which is a direct hit to the equity), capital is a real issue. Just as difficult will be the implementation of new liquidity rules particularly given the dearth of liquid assets in the eurozone. Everyone is also very focused on the maturities of sovereign debt this year. But one issue that markets may not have fully considered is the immense amount of private debt European banks will need to roll this year. 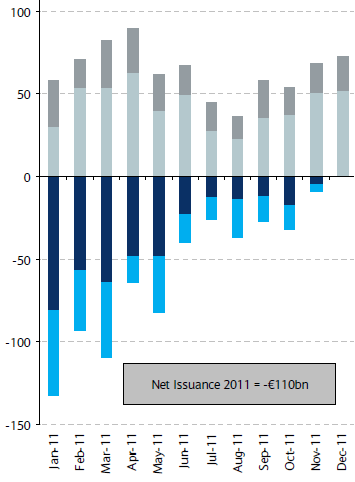 In 2010 the difference between maturing bank bonds and newly issued debt was a deficit of only EUR 3bn. Banks had no trouble rolling the vast majority of their debt as the chart below shows. 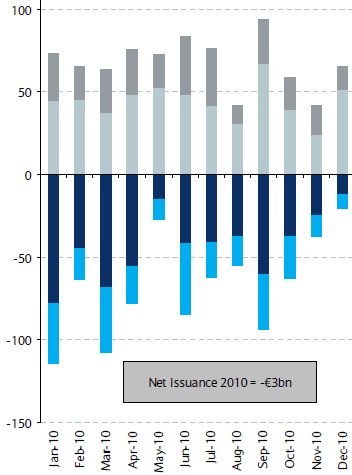 2011 started out well with significant new issuance but as the year went on, new issuance dried up, while maturities kept coming. The deficit became EUR 110bn in 2011, which had to be financed via the ECB. 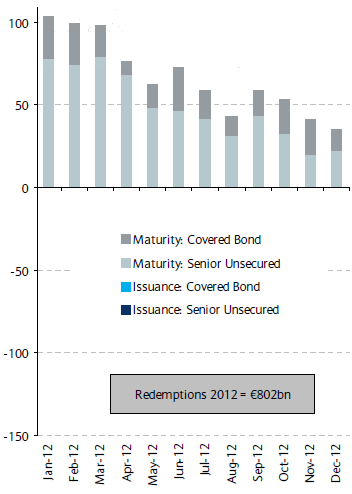 And here is what's in store for us this year: EUR 802bn of maturing debt that was issued by European banks. The first quarter maturities volume is particularly high. The ECB: the Eurosystem has launched two Covered Bond Purchase Programmes (CBPP, which ended in June 2010 and CBPP2, which started in November 2011) in to order to purchase euro-denominated covered bonds and, since 10 May 2010, it has conducted interventions in debt markets under the Securities Markets Programme (SMP). The liquidity provided through the SMP is currently absorbed by weekly collections of fixed-term deposits. Not clear how much will get absorbed through this program, but it should help. The unsecured debt however remains a major issue. If 2011 is any indication, private investors will only buy limited amounts of bonds and only from the strongest European banks. The rest will have no "home". If this debt were to get replaced by the ECB funding as was the case in 2011, the banks will need to come up with a great deal more collateral. It's one thing to obtain collateral for the EUR 100bn deficit, but it's quite another to convert some EUR 600bn of maturing unsecured debt into secured loans from the ECB. Going forward either the ECB expands their definition of eligible collateral further (as they have already done) or the eurozone governments, the ECB, or the IMF would need to provide unsecured financing (possibly taking some equity as compensation). Both outcomes will be extremely difficult, given that many banks will be competing for debt financing with their own governments.